Discover the world’s finest quality asphalt from the Pitch Lake deep in south of the island. Trinis claim it as the eighth wonder of the world, although from a distance it resembles a car park. This asphalt is used to pave roads all over the world. A short picnic with sandwiches and refreshments will be provided after the first part. Going back in direction north we will stop by the Temple in the Sea known as Waterloo Temple. The Temple stands on a pier surrounded by water and a very amazing history stands behind it. 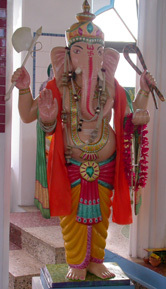 Shortly after we will reach Carapichaima with it’s majestic Hanuman Murti statue. 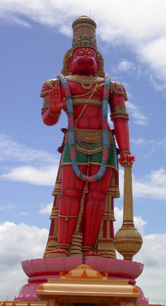 It is with 26 meters the biggest Hindu monkey-god Hanuman outside of India. Our last stop will be Caroni Swamp and the Bird Sanctuary. This is the islands only roosting place for the national bird, the scarlet ibis. We will drive with a boat through the mangroves and try to catch the wild life as much as possible. Price US $ 120 per person including lunch, entrance fee and refreshments. Visit with us the birdwatcher’s paradise situated inside the 800 000 square-meter Spring Hill Estate, the Asa Wright Nature Centre. Before we going on a 1 ½ hour tour through the Estate we will relax for a bit on the terrace were we will get the chance to see some of the birds feeding. Shortly after we had a local cuisine lunch we will leave to be right in time to join the tour in the Caroni Swamp and the Bird Sanctuary. This is the islands only roosting place for the national bird, the scarlet ibis. We will drive with a boat through the mangroves and try to catch the wild life as much as possible. Port of Spain is the hub of the booming economy of Trinidad and it is busier than ever. You will get the opportunity to see historical buildings like the magnificent seven but also just the real live of Trinidadians. Take a deep dip into a Caribbean Capital. Price US $ 55 per person. The first part will be driven with the car to continue a nice ride on the sea to finally reach our destination. In time to get ready for the superlative excitement - the watching of the turtles. This experience is amazing. When you stand in the dark night under the watching stars and see how a huge leather back turtle comes out of the water to look for an appropriate place to nest. You are quiet; you don’t move – you are even too afraid to breathe. 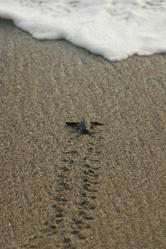 Then finally the turtle got her right spot and she starts to dig deep into the sand. This is the moment you catch to have a closer look. Finally when the whole is deep enough she will start to lay the eggs into the whole and covers them up after she is done. Then she will leave to go back into the water – because her hard work is done. We will just move to the next one to repeat this amazing event until we get tired. Next morning we will start our day relaxed with some free time until we start our hike into the bush. After a nice hike through the new terrain we will build our tree house to sleep for the night. On the last morning we will hike back to the Hotel to refresh ourselves and get ready for the boat ride back to the car. Price on request including boat fee, accommodation, food, fees and refreshments. El Cerro del Aripo 941m. 2 – 2.5 hrs uphill trek through dense Evergreen forest on a narrow trail. Once at the cave, you will notice a huge gaping hole and begin to hear the eerie sounds from the famous oil birds. We normally descend a few meters into the cave to view these unique birds. Oil Birds are the only nocturnal fruit eating birds in the world and are also called devil birds due to their sounds and red coloration of their eyes. Price: US $ 100 per person including local lunch. Tamana Cave is situated in the center of the highest mountain in the Central Mountain Range of Trinidad – Mt Tamana 307 meters. This is an evening tour which entails approximately 30 – 45 minutes uphill walking through cocoa estates and Evergreen Forest. At the cave, we can descend approximately 20 meters underground to get a close-up view of thousands of bats dwelling in this cavity. As twilight steps in, we then stand at the mouth of the cave to witness the spectacular exodus of over 1 million bats exiting in a spiral formation as they go out to feed for the night. Price: US $ 88 per person including take away dinner. Double Rivers waterfall is nestled in the Northern Range and close to the rustic, agricultural village of Brasso Seco. Our riding trail was once used as a utility road by the French and Spanish during the 19th and early 20th centuries for their workers to transport various crops like cocoa, bananas and plantains. Before such times, it was a trail that the Amerindians used to connect their villages/settlements. Today what we ride on is a dilapidated road surface that eventually falls into an off-road trail. The trail is very undulating and can become very muddy during the rainy season (June- Nov) which makes it challenging. However, it is very picturesque as we ride through old cocoa estates and lush green forest that line the mountain sides. We visit the peaceful village of Brasso Seco to begin this adventure. This trail is great for Mountain Biking as it meanders through beautiful, virgin forest as we proceed on a flat to undulating trail with one climb and descend before we reach the Northern Coast and Caribbean Sea. The trail starts off wide but then flows into a single track which can really test your Mountain Bike skills. There are small rivers to cross and some sections where you will have to walk allowing a fitness, fun adventure. Just before we arrive at the Bay we park our bikes and take a 15 minutes’ walk to the famous Paria Waterfall. At the waterfall, you will be treated to a powerful 15 meter cascade with a huge, deep, aquamarine plunge pool for swimming amidst sheer greenery. After the waterfall experience, we visit the picturesque Paria Bay before we return on bike to Brasso Seco village. Price: US $ 125 per person inclusive packed sandwiches and local lunch. Your adventure begins in the rural fishing village of Blanchisseuse and proceeds along an ancestral trail with spectacular vistas of a most jagged coastline, with the ocean on one side and forest on the other side to Paria Bay. The trail was an Amerindian trail that was used to connect Blanchisseuse to villages in the north east of the island. The route is very undulating with a couple of steep hills to overcome before arriving at picture postcard Paria Bay. From Paria Bay we then head into the forest to locate Paria Waterfall with its powerful 15 meter cascade and huge, deep, aquamarine plunge pool for swimming amidst sheer greenery. After the waterfall experience, we then return in the opposite direction to Blanchisseuse on the same trail we used to enter. This package combines great sightseeing opportunities with nature walks and a hike to Avocat waterfall. We swim at the base of the falls in the beautiful pools, relaxing in the cascading tranquility of one of Mother Nature’s most serene locales. After this enchanting stop we then head off to visit the most popular beach in Trinidad and there we will sample one of Trinidad’s most famous local delicacies. Your tour takes you through very narrow, winding, mountainous, country roads to Asa Wright Nature Centre which is an internationally recognized nature resort. A great place for bird watchers and nature lovers in general. 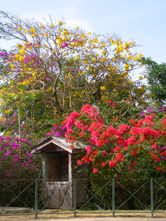 Here you can sit on the verandah of the old estate house and absorb the vast, natural vistas that nature has to offer or take an interpretive nature walk conducted by one of the guides to learn about various flora and fauna in Trinidad. A hefty sandwich lunch will be served on the verandah. (1-1.5 hours total hiking) that is both on land and in the exotic Marianne river which meanders through picturesque, evergreen forest. Once at the waterfall, you will be treated to a 20 meter cascade with an inviting pool for swimming at its base. This waterfall is called Petit Marianne or Avocat. On returning from the hike, we travel to the North Coast to visit Blanchisseuse from where we proceed along a most raw and jagged landscape with very scenic vistas of the Caribbean Sea and mountainous forest on either side of the road-way. Later in the evening, we then stop at Trinidad’s No. 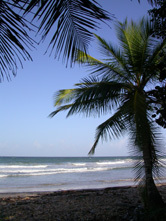 1 beach, Maracas Bay where you can take a swim in the cool Caribbean Sea or simply bask on the warm white sand. At Maracas, you will also get a chance to taste Trinidad’s popular local delicacy Shark & Bake sandwich. Finally, your tour takes you through the outskirts of Trinidad’s capital city – Port of Spain and ending at your guesthouse/hotel or back to the airport. No.1 beach – Maracas Bay, where you get an opportunity to sample one of Trinidad’s favorite sandwiches - Shark & Bake. At Maracas Bay, you can also bask on the white sandy beach or take a swim in the cool waters of the Caribbean Sea before departing for home. The Tours are in collaboration with different partners. Guests are notified about their pick-up times for all excursions, our tour guides are instructed to wait for clients maximum 15 minutes and then leave. Sickness of guest with doctor’s certificate.